. Let's fast foward to this lady named Abby Dodge, first we bonded on twitterverse over our Leo Power, when we discovered we were born in the same month. '4 is the magic number'. Please visit Abby at her site. Desserts 4 Today holiday cookie videos are also up and running on Fine Cooking site. 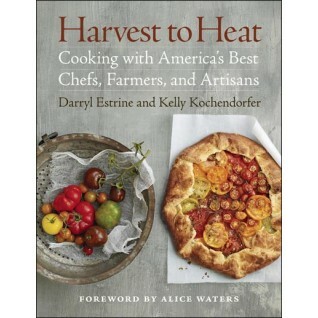 Lastly, we are giving away a newly released book, October 2010, Harvest to Heat : Cooking with America's Best Chef's, Farmers and Artisans written by Darryl Estrine, Kelly Kochendorfer and a forward by Alice Waters, published by Taunton Press. Amazing find! Harvest to Heat just won accolades from Epicurious, The Best Cookbooks of 2010, best overall at number one! You can review the entire six cookbook list here. We have converted our diets to mostly organic, sustainable and locally resourced when possible for a healthy lifestyle living since our son was two. Looking through my blog you will see I frequent farmers markets so I can't wait to dig into this book. Thank you Taunton Press for your generosity! 1. Please follow on twitter @abbydodge and @finecooking magazine. 4. Leave a comment on this post! You are encouraged to share a comment about Desserts 4 Today, Fine Cooking magazine and Harvest to Heat or any other thoughts. 5. Drawing will be done randomly from all comments recorded by Wed., Nov.17 at midnight and three lucky winners will be announced Thur., Nov. 18. Disclaimer: I received the review copy of Desserts 4 Today and one extra giveaways copy. I also at no charge received giveaway copies of Harvest to Heat and current issue of Fine Cooking magazine with a full year subscription. I was not solicited for my opinions or my review. 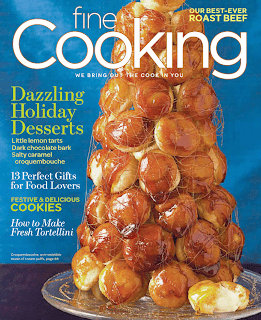 It was a challenge to pick recipes from the most recent Fine Cooking Magazine and Desserts 4 Today. From Fine Cooking, I wished to make the Pan Seared Chicken Thighs with Beer and Grainy Mustard Sauce, the Apple, Fennel and Cheddar Cheese Straws as well as the Pear, Cranberry and Blood Orange Mostarda. I cannot even begin to tell you how precious Desserts 4 Today is, I was tempted to bake the assortment of crisps and snaps and lemon melt-aways in the cookies section. Coconut Creme Caramel from creamy desserts section and toasted coconut ice cream from frozen desserts section. I have decided to be true to holiday fashion and my in season (cranberries and pears) motto and churn Creamy Cran-Raspberry Sherbet to go with your Thanksgiving dessert table. Every year around Chanuka I like to feature a new doughnut, when I saw the Pear Fritters with Lemon and Ginger at Fine Cooking's holiday issue, I could not look back, and believe me I've tried! This is not a yeasted doughnut but thought it a nice twist to a holiday tradition! I can envision it at the Chanuka table as well as a New Year's Eve party. Keep in mind since cranberries were my first introduction to North American indigenous fruit, while weathering my first Winter in the United States in New England, I was sentimental and used for the first batch only cranberry juice. My second batch was the cran-raspberry recipe below. While the first batch was pure, crystal clear one single flavor, the second batch, cran-raspberry, had an added depth and dimension. Pairing the flavors is a winning combination. The consistency is as luscious as depicted so beautifully in the photograph below. Recipe from Desserts 4 Today by Abigail Johnson Dodge published by Taunton Press, 2010 Photograph by © 2010 by Kate Sears. 1. Have ready an ice cream maker. 2. Put the juice, cranberries, and sugar in a medium saucepan. Cook, stirring, over medium heat until boiling. Reduce the heat to medium low and simmer, stirring occasionally, until the berries have popped, about 6 minutes. 3. Strain the mixture through a fine-mesh sieve into a large bowl, pressing firmly on the solids (discard the solids). Set the liquid aside to cool completely, then refrigerate until chilled or for up to 1 day. For faster cooling, set the bowl over a bowl filled with ice and stir occasionally until well chilled. 4. Arrange an 8-inch-square pan in the freezer, making sure it’s level and secure. Add the heavy cream to the berry mixture and whisk until blended. Pour the chilled mixture into the ice cream maker and process according to the manufacturer’s instructions. Serve immediately (it will be soft) or scrape into the chilled pan, cover, and freeze until firm or for up to 2 days. • Mix 1⁄2 cup mini chocolate chips or chopped chocolate into the just-churned sherbet. • Serve with Killer Chocolate Sauce (page 179). • Serve in chocolate-coated or plain waffle cups. • Add 1 tablespoon finely grated orange zest to the cranberry mixture. Keep in mind after macerating pears, from recipe below, I whizzed them in a food processor quickly to completely blend flavor and ingredients into dough for smoother consistency. 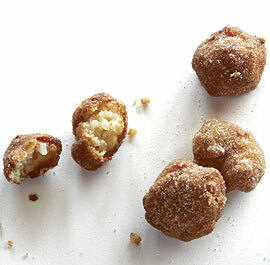 It created a sublime delicately flavored fritter/doughnut. You can be true to recipe and follow exact directions for slightly different but just as superb results. Both recipe and photograph are courtesy of Fine Cooking. Pear, lemon, and ginger are a match made in heaven. These crisp-yet-tender fritters would make an excellent dessert at Hanukkah. In a small bowl, combine the pears, ginger, lemon zest, 1 Tbs. of the sugar, and 1/8 tsp. of the cinnamon. Macerate at room temperature for 15 minutes. In a medium bowl, whisk the egg whites to soft peaks. In another medium bowl, whisk the milk, 1/2 cup of the sugar, and the vanilla until the sugar dissolves and the mixture is slightly frothy. Whisk in the flour just until combined—it shouldn’t be completely smooth. With a rubber spatula, fold in the egg whites, and then fold in the pear mixture. In a small bowl, mix the remaining 1 cup sugar and 2 tsp. cinnamon. Pour 1/2 inch of oil into a 10-inch cast-iron skillet with a candy thermometer clipped to the side. Heat over medium-high heat to 350°F. Using 2 tablespoons or a small ice cream scoop, carefully drop a ball of batter into the hot oil. Add 4 or 5 more to the oil, but don’t crowd the pan. Fry until golden-brown, about 2 minutes. Using a slotted spoon, turn the fritters over and continue frying until golden-brown and cooked through, about 2 minutes more. Transfer to a paper-towel-lined plate and drain briefly. Toss in the cinnamon sugar to coat and transfer to a platter. Continue cooking the rest of the fritters in the same manner. Serve hot. Cran-raspberry sherbert... you're a girl after my heart. I love... no LOVE cranberry almost anything. Mmm, wonderful, nice giveaway. I love Fine Cooking and aspire to be cook as well as Abby Dodge. What a great giveaway! I would love any of the prizes! I also follow @abbydoge and @finecooking as well! Seriously, Shulie! You're killing me, here! LOL! I love Abby, too - she's awesome - and I'd love to win her book or any of these prizes! And I follow both you and Abby on Twitter and Facebook! I liked Foodwandering's facebook page. This sherbert looks yummy. Never had cranberries in sherbert before. Maybe it's time to pull out my ice cream maker. I follow @foodwanderings on twitter. I also follow @abbydodge on Twitter. I follow @foodwanderings on FACEBOOK. I just started to follow @AbbeyDodge and she followed me back. I will again RT your giveaway I hope you see. let's rock. i already follow you on twitter. i've also been following abby and fine cooking for a while. I'm following you on Facebook too. Enjoying following @finecooking on twitter. Have been following @Abbydodge for a while now...adore her! I just sent out an RT for you and the giveaway on Twitter! 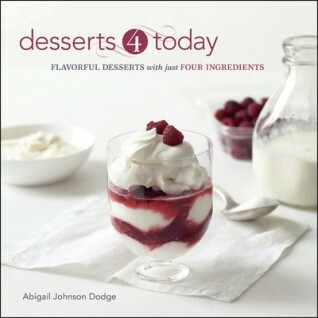 It's easy to leave a comment about Abby Dodge and her new cookbook Desserts 4 Today! It's FABULOUS! I am a big Fine Cooking fan! Already following & liking @foodwonderings and @abbydodge and just added @finecooking to twitter but read mag all the time. And now I know another thing to do with the bags full of cranberries I froze from the cranberry fest on Cape Cod this year! Yay, Shulie--not for giveaway, but to cheer you on... Thank you, we are so lucky to count you as our friend! What awesome giveaways you have thr, thanks so much for the heads didn't wanna miss this chance. well i thought i'd already left a comment on this but now can't find it - drats! so YES I FOLLOW YOU FABULOUS WOMAN ON TWITTER! and yep I LIKE YOU ON FB! and i follow fine cooking - love them! I follow you, Abby and Fine Cooking on twitter!! Yippe-this is a great giveaway! I follow Abby and now Fine Cooking on twitter. Now I'm following also @abbydodge and @finecooking magazine. and I tweeted about this wonderful giveaway! After reviewing one of Abby's recipes for Cooks&Books&Recipes, and blogging today about it, I seriously HAVE to have her Desserts 4 Today! Pear fritters with ginger--Oooo, that sounds too good to be true. I also would LOVE the Fine Cooking magazine in my mailbox!! I will retweet! Already following Fine Cooking -- will follow the others, too! YAY, I made it in time to this giveaway! :) Love fine cooking and been wanting Abby Dodge's book. Harvest to Heat looks & sounds like a great book as well. Fingers crossed! didn't know fine cooking is on twitter until now. following them now, too! This is a very nice giveaway! :) I follow you and Abby on Twitter. I follow @finecooking on Twitter and have taken their magazine for years. It is one of my favorites when it arrives. I love the photos (many with step-by-step instructions) and the flexibility in many of the recipes. Pear fritters! What a perfect treat for family to ooh and ahh over together during the holidays. Posted the giveaway on Facebook! Harvest to Heat looks lovely. Fine Cooking magazine is one of my favorites, but I don't have a subscription. Plus, I have been eyeing that Abby Dodge book ever since it came out. I follow @abbydodge & @finecooking. I "like" FoodWanderings on Facebook. Best of luck to everyone! Another fabulous giveaway! So many comments! I adore Fine Cooking, and I know that I would be thrilled with that cookbook. 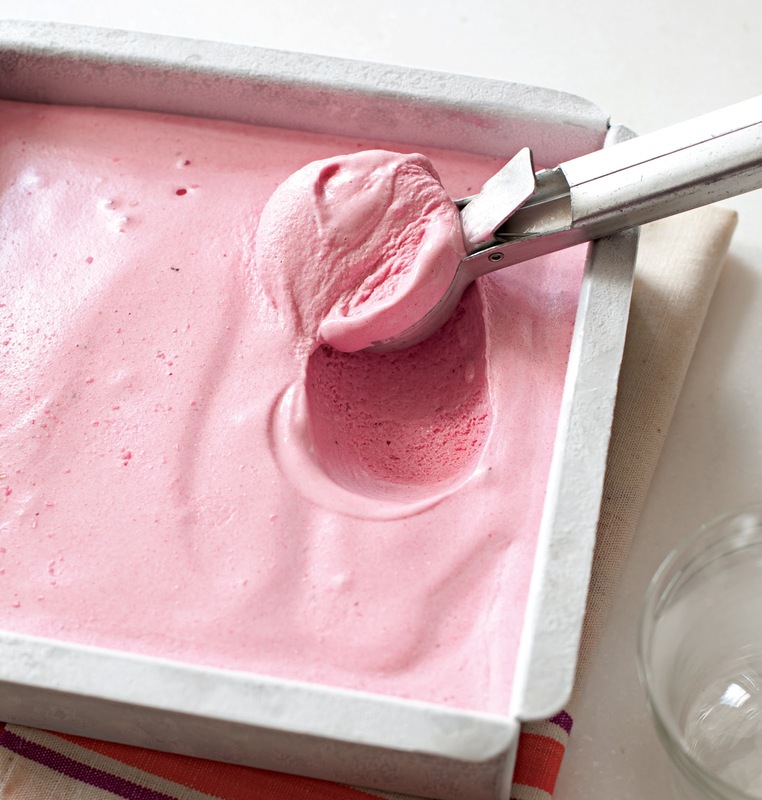 The raspberry sherbet you shared is just beautiful. Thank you for sharing with us. I hope you are having a relaxing day! Dear Readers/friends, Drawing for this giveaway is now closed! Thank you for all your wonderful comments. Lucky winners are @smithbites, @rachelcurrier & @RJFlamingo.